Can you imagine how exciting it would be to win $1000 in Karina Dresses? In my experience Karina Dresses are the most comfortable dresses that I have ever worn! Simply Stacie has joined with an amazing group of bloggers to let you see this gorgeous collection of dresses which can be worn by real women of all shapes and sizes. To make this experience even more exciting you will have the opportunity to enter for a chance to win $1000 in dresses from Karina Dresses! In addition to being absolutely the most comfortable dress that I have ever worn, Karina’s dress designs are stunning with vibrant colors, bold prints and patterns and high quality fabrics to choose from in a wide selection of styles and sizes. I appreciate that the flattering cut of each dress makes it very becoming to a woman’s figure, even those of us who are not models. As a bonus for all of us busy gals, Karina dresses are so easy to take care of as they can be machine washed and is virtually wrinkle free making it ideal for traveling or vacation. Karina Dresses has a newsletter you will want to get in your inbox. Each weekly newsletter has a winner of a new dress selected from the email subscribers. You have to open the email to see if it is you! In addition to giveaways, The Karina Dresses newsletter also has flash sales with the hottest prints at almost 50% off. To make this newsletter even more desirable to join, if you sign up and confirm your subscription (or are already a subscriber and enter this giveaway) you will be entered into the sweepstakes for $1000 in Karina Dresses! Are you ready to join the Karina Nation? Subscribe here! If you are a blogger and you would like to do a review of a Karina Dress, they choose their reviewers from their affiliates! Are you ready for extra entries? Use @KarinaDresses and #Dresstacular to let Karina know your favorite dress from the Dresstacular™ bloggers. You can also get 100 entries a day by commenting on each of the bloggers posts from the linky below! 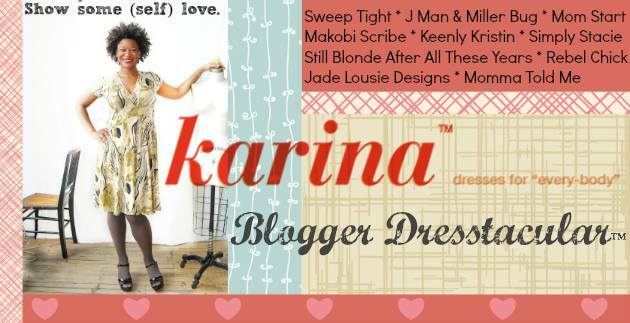 Each of these bloggers is highlighting a dress from Karina Dresses! Hop around to each one and earn extra entries towards the $1000 Karina Dress Sweepstakes!